Holi or Holika, is a spring festival celebrated at the approach of the spring season, during the 3 or 4 days preceding the full moon day in the month of Phalguna. Holi is celebrated by throwing colors and colored powder in the air. Colorful Rangoli patterns are painted at doorways to houses. Families assemble around a fire throwing prasad and coconut in the fire. They also take home prasad. 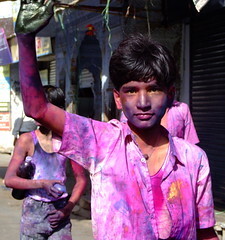 The Holi festival marks the end of winter and the beginning of spring. Essentially, Holi means the triumph of good over evil and conquest of sensual values by spiritual values. Thus, Holi has different mythological connotations in different parts of India. The story relates to an ancient demoniac king in India known as Hiranya Kasyapu. He was a cruel and tyrannical ruler. All his subjects followed his orders except for his son Prahlad. Prahlad was an ardent devotee of Vishnu. This infuriated his father who wanted to punish him. The king asked Prahlad to embrace a red hot pole. But, he was unhurt. Then, he asked Prahlad to jump off a steep cliff, but was unhurt again. Prahlad obeyed his father each time chanting Vishnu’s name. Hiranya Kasyapu ordered that Prahlad be trampled by an elephant. But, he was unhurt. As Prahlad was not hurt by all the punishment, Hiranya Kasyapu called his sister Holika from the gods that she would not burn in a fire. Holika made Prahlad sit on her lap in the fire. But, this time, Holika was burnt to death and Prahlad was unhurt. Eventually, the ordeals faced by Prahlad climaxed in the emanation of Narahari or Narasimha who destroyed Hiranya Kasyapu. Again, this displayed the triumph of a true Bhakta (devotee) over the evil represented by Hiranya Kasyapu. Prahlada never lost faith in the Lord despite all his ordeals. The ceremony of Holika Dahan is observed on the full moon night in the month of Phalgun. The event signifies the burning of Holika on huge wooden pyres all across the nothern states in India (and also in the western state of Gujarat). People start collecting wood from many days before the actual event and the pyre is built over time by kids and adults alike. On the night of Holika Dahan, huge crowds gather around the pyre and make offerings of barley and wheat (from the freshly harvested crops) and priests will make offerings of coconuts into the fire. The pyre is then lit to chants of “holi hai, holi hai” (it is holi, it is holi!). Once the fire cools down, the Holi festival begins by people smearing the ashes from the fire on each other. The spiritual significance of this event is that people participating in the Holika dahan are pledging to “burn away” their bad habits accumulated over the year and renew their faith in Lord Vishnu. The modern festival of Holi is celebrated on the day after the Phalgun full moon by tremendous gaiety and revelry by people of all walks of life. It is a day of particular freedom for kids who look forward to this day with great anticipation. Water balloons filled with color water are hurled at passer-bys, pichkaris and water guns filled with water are squirted in all directions and impromptu street gangs roam the neighborhoods looking to include everyone in the revelry. On a more sedate note, some adults prefer to observe a dry holi by greeting fellow adults with gulaal (a colored powder of various hues) – the colours are traditionally made of Neem, Kumkum, Haldi, Bilva, and other medicinal herbs prescribed by Ayurvedic doctors.